I plugged in the URL when I got to a computer and found their blog. This occasion confirmed something many of us already know all too well: getting your message out there has never been easier. This group uses a blogger blog, a GMail account for contact info, and a Photobucket powered photo/video repository– all of which are free, simple, and effective. GALL stands for Guerilla Art Liberation Lives. Our goal is to rescue the arts from the glass case in which modern society has imprisoned it. We believe that the separation of art from its audience is detrimental to the pursuit of art itself. As a reaction to society, art should also elicit an immediate reaction from society. Our aim is not to create art that will go down in history, but rather art that those who encounter it will not soon forget. They just started in September of this year (or that’s what I gather from their blog) and it promises to be an interesting development on campus. Now some of you who know I am UMW Blogs obsessed may be wondering if I am not a bit sad that this wasn’t done with UMW Blogs? Well, of course, but it also pushed me to do a little experiment that has me pretty excited. In theory UMW Blogs can integrate Blogger feeds into the latest post display as well as the archive of all posts, but I hadn’t tested it out with a live blog yet. Well, I finally got my chance!!! 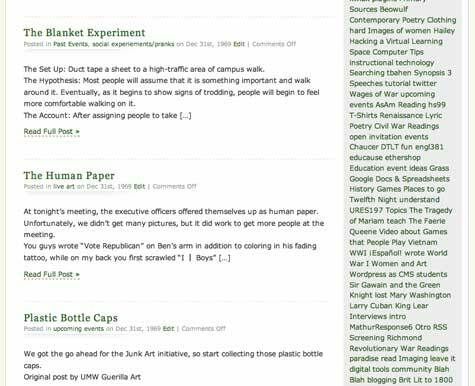 The UMW Guerilla Art blog is now being fed into UMW Blogs’ latest posts page and being stored in the searchable archive, moreover the tags they use will show up in the UMW Blogs tag cloud -sweet! 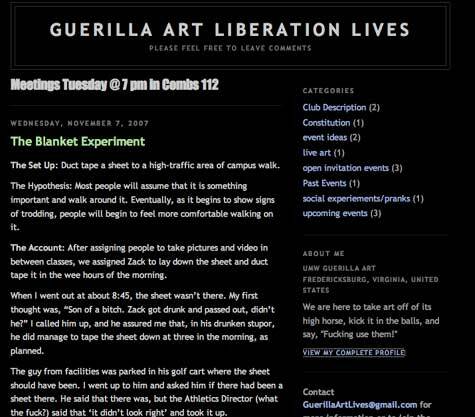 All of which simply means if folks are looking for some Guerilla Art at UMW they will find it via UMW Blogs (or Google of course) –but hey, small pieces loosely joined is all about providing many ways to make your voice more widely heard, and UMW Blogs fits the bill. So, get your own blogger blog people, we’re not scared, just give us the feed!!! This entry was posted in art, fun, UMW Blogs and tagged bloggging, guerilla art, student groups, UMW Blogs, umwblogs. Bookmark the permalink. I noticed that their feed was coming through on UMW Blogs, very cool! I ended up talking about them on the podcast (The Wompcast if you will) me and Joe recorded yesterday. I definitely plan on attending one of their meetings.